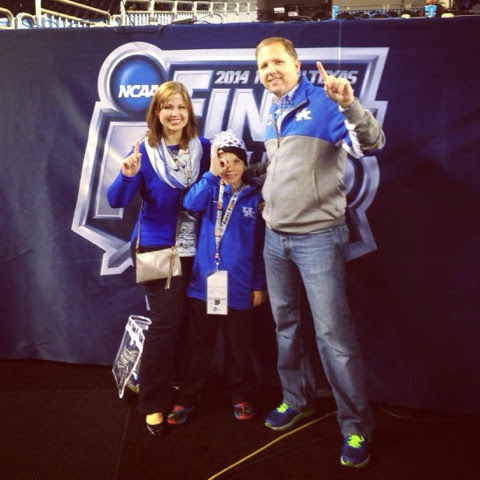 The second the buzzer sounded after Aaron Harrison's spectacular game winning shot against Michigan to reach the Final Four, my husband said, "We have to go." Within a few hours, we had made travel arrangements, hotel reservations, found tickets, and made sure my mom could fly over and stay with our younger boys. 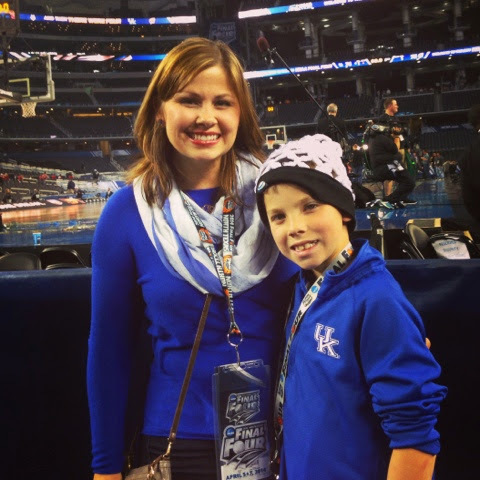 By Friday, I had gotten a Big Blue pedicure, packed my lucky sweater, and rounded up all of my eldest son's Kentucky gear. I put on my lucky blue earrings (which were, oddly enough, given to me by my very dear friend who just happens to be the biggest Gator I know). Had John known Russell Wilson's collegiate loyalties, he would have left the Seahawks lid at home, I'm sure. This guy was on our flight. Proud to say I successfully controlled my tripping foot. 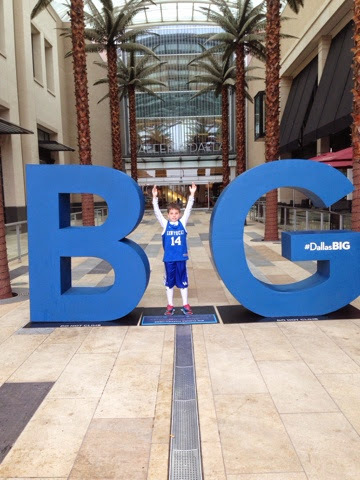 Yes, there is something Big and Blue happening in Dallas! 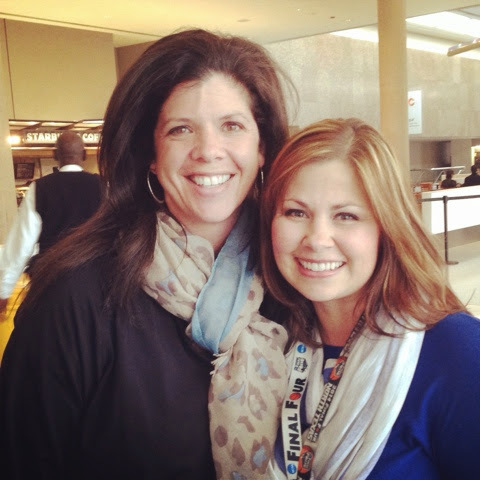 I was so excited to run into my Transylvania University friend, classmate, and sorority sister, Lisa Ezell Allen! This was definitely good luck. 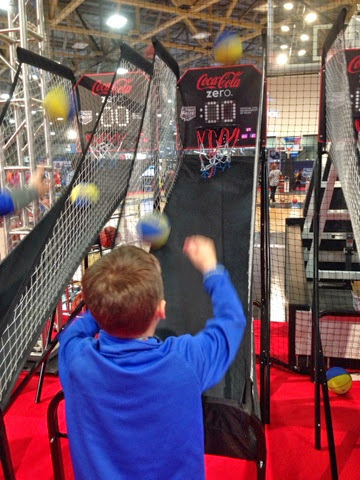 Almost beat his old man in Pop-a- Shot! 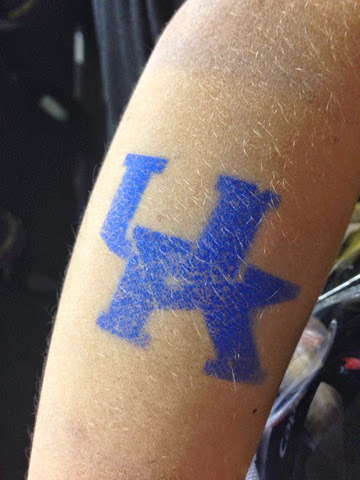 This IS the year of the UK tattoo, right? Unfortunately, they didn't have this one available. 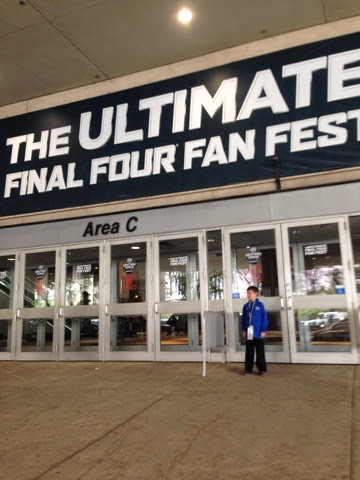 Before leaving Bracket Town to make the drive to AT&T Stadium, we picked up some official Final Four merchandise. 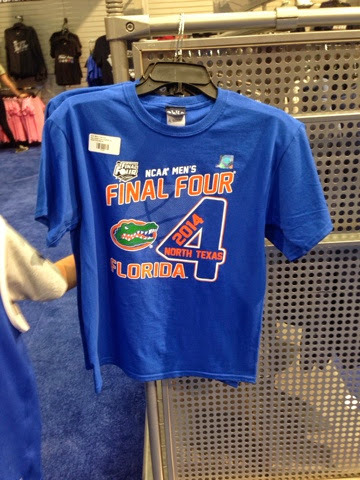 We are so nice, we even picked up some Gator gear for our sweet friends. Absolutely thrilled to share this time with my favorite ten year old Wildcat! 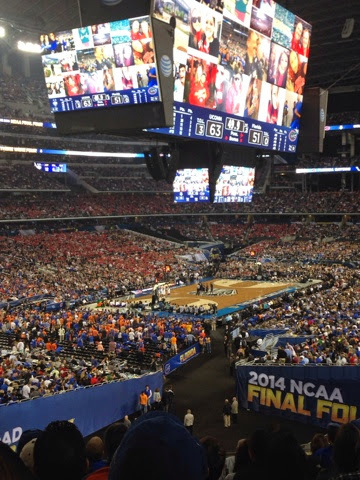 I really wanted to see an All-SEC final. Boo. That many people and very little traffic control. It was a late night, but we didn't mind. Why? When the game ended, we hugged strangers and didn't care at all. 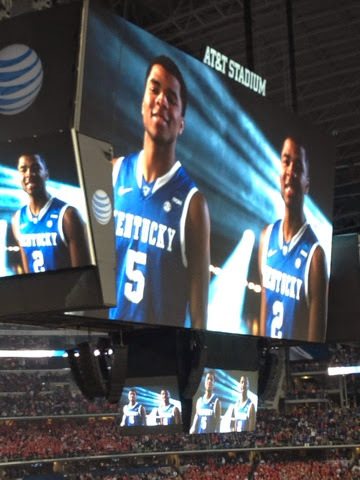 More than one Cat fan was overheard saying, "I'm so happy, I don't even know what to do!" Then there was more hugging, because that's what you do when you are so happy you don't know what to do. Here I sit on Monday, back at my house in North Carolina, a decision made in favor of school and work, and one I knew we would regret. 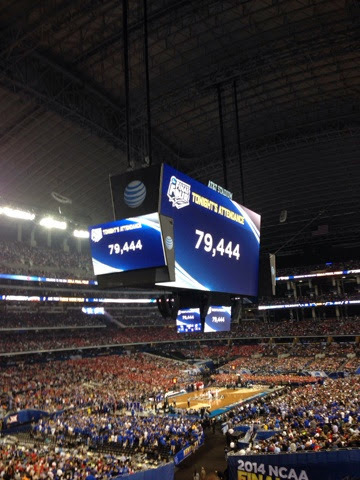 I desperately want to be back there in Dallas, or at least somewhere on Limestone. I feel as antsy as you probably do, but don't worry y'all. I have my lucky earrings. 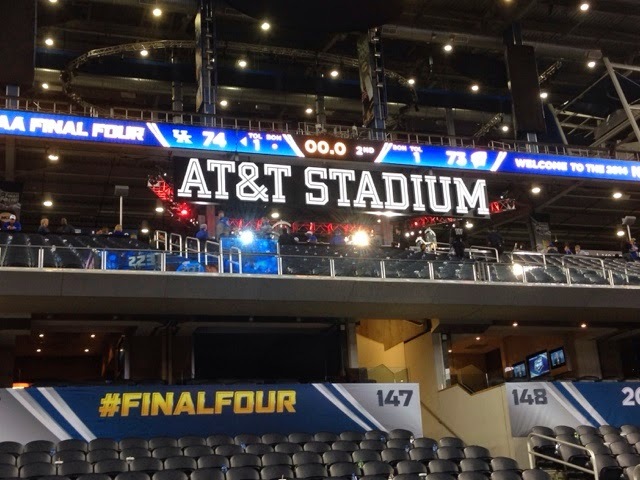 In "allie", "final four", "kentucky wildcats", "ncaa tournament"
Way back in 1990, soon after beginning her career as the Director of Tourism for Henderson County, Marcia Eblen was busy brainstorming ideas for new community events. I feel confident that some divine intervention led her to discover that W.C. Handy, also known as the "Father of the Blues," had spent significant time in Henderson. While in Henderson, Handy met his wife, Elizabeth, while performing at a barbecue. Outdoor music? Blues? Barbecue? Sounds like a festival to me! Kicking off the festival is the William Branaman Street Strut People's Parade. This parade has evolved from a few dozen curious folks parading alongside the few who were adventurous enough to dress up for the event to a crowd favorite with tons of Hendersonians of all ages going all out in their costumes to decorating their wagons, strollers, and parasols, ready to strut and compete for the title of Grande Ooh-Pee-Doo. The Parade forms at 9:30 am on Saturday, June 8th, at Central Park. Henderson residents enjoy a Street Strut and showing off their creative decorations. Throughout the week, there are several Handy Lunch Breaks and Happy Hours at many of Henderson's favorite downtown restaurants, including Rockhouse @ Wolf's, Commonwealth Kitchen + Bar, Planters Coffeehouse, Delizio On the Corner, and On Deck. Check here to see the full calendar of events. Do yourself a favor and go enjoy some part of this wonderful community event. You will love it, even if you don't fancy yourself a blues lover. Trust me! If you have been once or for twenty three years, let us know your favorite thing about the festival. In "allie", "festivals", "henderson", "wc handy festival", "wc handy"
Before Memorial Day is too far past us, I want to share with the rest of you fine Kentuckians something special that we Hendersonians observe every year. Our Central Park is always lovely, but this is the time of year when walking or driving by has us all stopping to reflect upon our vast freedoms and those who have served our military forces to preserve them. Imagine gazing out at over 4,600 of these crosses, each one a tribute to a deceased Henderson veteran. For the past 67 years, these crosses have been displayed in conjuncture with Henderson's unique and emotional Memorial Day Service. I am willing to admit that as a very young child, I thought that all these people were buried in Central Park. I am only admitting this because I bet I'm not alone! Once I grew old enough to know better, I realized what an enduring, tangible reminder our community has of the many sacrifices made by our brave veterans. great-grandfather from her precious great-grandmother. Read more about this longstanding Henderson tradition in this recent article by the Gleaner. What does your hometown do to honor its past and present military service members? In "allie", "henderson", "memorial day", "traditions"
As all Kentuckians know, there is no time quite like Derby. I won't go on too much about how I'll be here in North Carolina, settling for a measly two hours of Derby coverage and absolutely no local news flavor. I did not see a single Thunder firework, won't be out at the mini admiring the balloons floating overhead (although I understand the balloon race has moved to Friday since I have been gone, so I guess none of us will be doing that), have not partaken in a single chuckwagon treat. One of the best features of Derby Week is the fashion. If you are like me, usually running around town in your yoga pants, you relish the opportunity to dress the heck up. One thing Kentuckians know is how to do it up right for Oaks and Derby. Start with a hat or fascinator, then find your dress, and don't forget to choose the perfect accessories. Speaking of perfect accessories, you need look no further than Louisville's own wonderful W&M Custom Jewelry. If you haven't heard of W&M Jewelry (And if you haven't... WHAT? Get with it! ), you can learn more about Megan Walz and Becky McClellan, the remarkable duo behind the brand, on their website or here in this article by StyleBlueprint Louisville. (By the way, I recommend the entire StyleBlueprint blog, so read through it when you have time and subscribe. My favorite amongst favorites is my dear friend Heidi, who wrote the W&M article.) Take a moment to peruse the lovely W&M website, and you will quickly discover that picking a favorite is simply not possible. Perhaps you could try to narrow down which bauble you want to get your hands on first, second, third... thirty-seventh, and so on. Here's a peek at just a few pieces that caught my eye. So let's get down to business. You have The Hat. Your dress is ready to go. Do your accessories measure up to the rest of your outfit? If there are two women whom I trust to accessorize me and have a blast doing it, certainly they are Becky and Megan. I mean, just look at these lovely ladies! 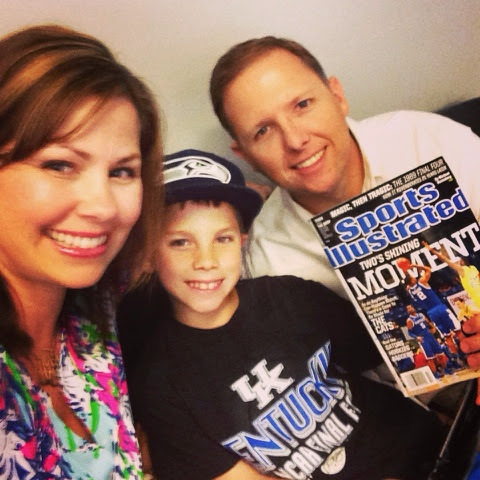 I hope you didn't miss Christa Ritchie's feature about Becky in the Courier-Journal! In addition to that inspiration, Becky offers excellent advice for your time at the track. Derby is the event where bigger is better. Big Jewelry, Big Hats, Big Fashion. This is the day where you want to show off your inner Derby Diva! Don't forget it's a "Pink Out" for the Oaks. W&M's variety of stones come in many shapes, sizes, hues, and styles that allow easy incorporation into any outfit. Spring in Kentucky and Derby Season are such a colorful time of year. Accessorize with a big, colorful W&M necklace and pair of earrings to finish off your perfect track attire. Don't be afraid of color! The perfect pairing for any fascinator are our classic tulip earrings. Not only are these the perfect match for any fascinator, but you'll get plenty of wear out of them, from the track to watching your kids' sporting events. Above all, don't forget to accessorize with W&M, drink a mint julep, and pack a comfortable pair of shoes! What's that you say? You wish someone would just give you a magnificent pair of W&M earrings to wear for Oaks or Derby or any other day? You're in luck! Becky and Megan have kindly provided us with a beautiful pair of gold peacock dangle earrings, and you can win them! (Notice that Becky is wearing a pair in her photo above.) I hereby promise in writing not to run off with them and pretend they were "lost in the mail." Not everyone can win, however, so seek out W&M in several Louisville boutiques. For my hometown honeys, head over to Owensboro and shop at Studio Slant. I even have good news for my local North Carolina friends! You'll be pleased to know that you can find W&M at several Monkee's locations, including Charlotte, Greenville, and Wilmington. For us Raleigh girls, let's head to Monkee's of Chapel Hill. In "allie", "derby", "giveaways", "herkentucky derby days", "w and m jewelry"